Everyone has favorite topping combinations, so this is mostly a demonstration of how to easily prepare the dough and cook the pizza. Make what you see here, or top yours with Pepperoni, mozzarrella, and parmesan. 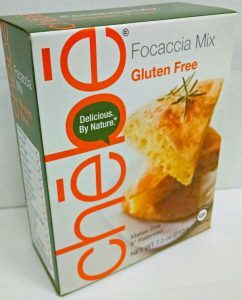 Use Chebe All-Purpose Bread Mix for your first attempt: satisfying and practically fool-proof! 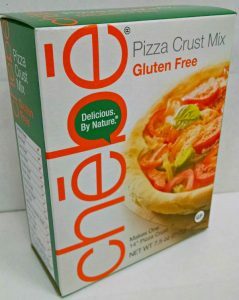 Pizza on the Grill – it’s a cinch! 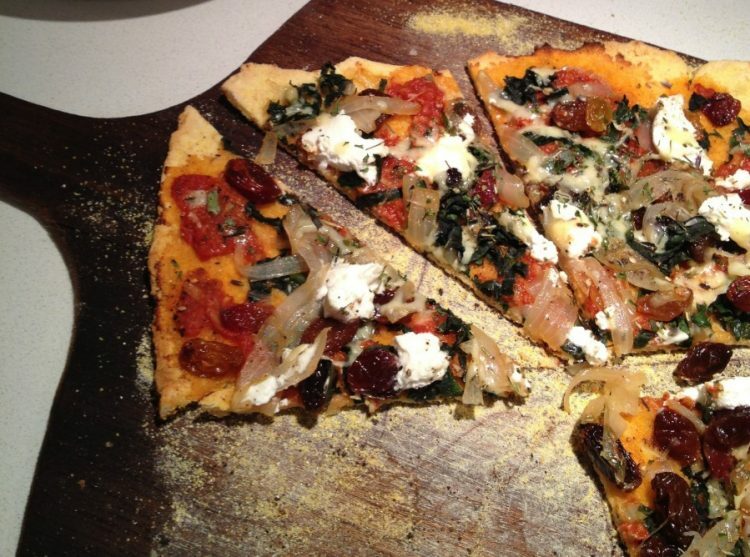 Pizza on the grill is the best: delicious, easy, fast…. 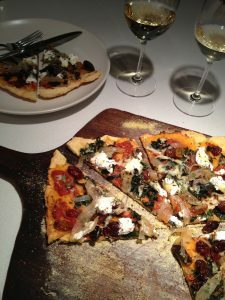 You’ll need a pizza stone and wooden paddle, both worth the investment since this is an act you’ll repeat often with increasing confidence and creativity. 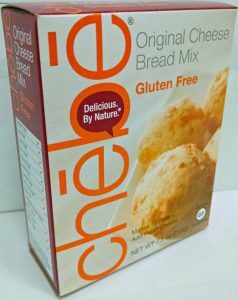 Put the Chebe mix in the bowl of a stand mixer. Add the eggs, olive oil, water, and cheese. Blend on low until the dough comes together. You may need to add a little water. The dough can be slightly sticky. Divide in half to make two pizzas tonight, or wrap and reserve the second ball of dough for tomorrow night. 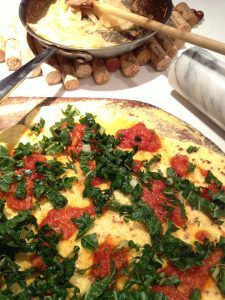 Turn the dough onto the wooden pizza paddle that has been covered with the cornmeal. Lightly turn and pat the dough to cover with cornmeal and form into a ball. Roll out the ball to 1/8″ thick, using more cornmeal as necessary to prevent sticking. No need to obsess about a perfect “round”. Let the edges form where they will: Artisan Pizza! Slide the dough onto the preheated stone using an extra large metal spatula. Close the grill and let cook for 1-3 minutes, or until the spatula can slide easily underneath. Flip the crust and cook for 1-2 minutes. 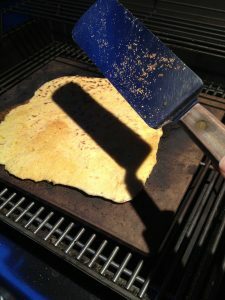 It’s going to get more time on the second side – just needs to be cooked enough to transfer to the paddle if you want to put on the toppings inside. Otherwise, leave on the stone, arrange the toppings, and cover to cook for 10-15 minutes until the toppings are bubbling and the crust is browned, but not burned. In a small skillet cook the onion, water, salt and sugar, stirring occasionally, over a medium heat until the onions soften and the water is just about gone. As the sugar from the onions and added sugar begin to brown at the edges, add a little more water a tablespoon or two at a time, continuing to cook until the onions are very soft and lightly browned. 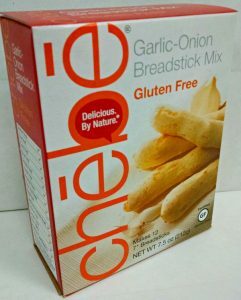 Set aside while you make or start cooking the dough. After the second side of the pizza has been lightly cooked, transfer the crust to the wooden paddle to bring inside and apply the toppings: ladle on the tomato sauce in splotches, taking care not to cover the dough completely. 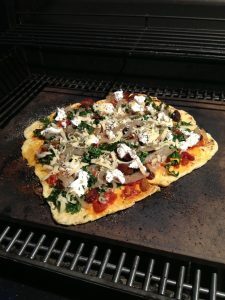 If the weather is good, and you can transport the toppings on a tray, keep the crust on the stone and proceed with the “decorating” of the dough outside! Evenly layer on the onions, chard, raisins, goat cheese, parmesan cheese. Finish with the herbs, ground pepper and a light drizzle of olive oil. Return the pizza to the stone, close the grill and cook for 10 – 15 minutes or until the top is bubbling and the bottom of the crust is a medium brown. If the crust is finished before the topping appears cooked, transfer to the oven and finish the top under the broiler. Transfer the cooked pizza to the wooden paddle. Slice and serve. It won’t take a lot of practice to make this perfect. Enjoy!